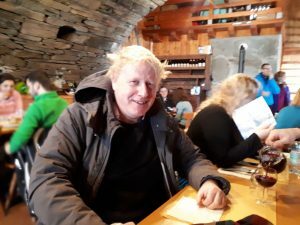 Boris Johnson, Ministro degli esteri britannico, seduto al tavolo di un rifugio in Val d’Ayas, Valle d’Aosta. Happy new Brexit! Boris Johnson, Ministro degli Esteri britannico, brinda a vino rosso e sorriso sornione affettuosamente circondato dalla sua famiglia. Attenzione però, il paladino del “Regno disunito” non festeggia in quel di Londra. E nemmeno tra le dolci e patriottiche colline del Cotswolds. Lui punta in alto, alla vetta. E qui l’abbiamo beccato. Incastonato tra il Monte Sarezza e il maestoso Testa Grigia, Val d’Ayas, Valle d’Aosta, Italia. Già. Vabbé, che c’entra con la Brexit, mica pure le vacanze devono essere patriottiche. E dopo l’impaziente attesa all’aeroporto di Caselle per noleggiare un’auto di cui tanto hanno parlato i media eccolo fare il suo ingresso, neanche a dirlo, alla “Tana del lupo“, due curve dietro l’attacco della seggiovia che porta nella valle di Gressoney. Entrato al rifugio certo non passa inosservato, gigantesco e slavatissimo circondato da giovane prole e bruna moglie si piazza al tavolo vicino alla stufa. “Vengo sempre qui”, mi dice quando mi avvicino per chiedergli se, si, insomma, la vecchia Europa ancora può avere appeal. Menù aperto in mano e vino appena versato mi racconta della passione per questi monti mentre i figli ridacchiano e la moglie Marina mi scruta dalla sua salda posizione a capotavola. “E’ bravo a sciare”? “Per niente”, dice convinto. E mentre con un brivido penso che devo svignarmela prima di rischiare di averlo vicino nella discesa post prandiale si lancia nel racconto della sua scalata estiva. Prima la notte al rifugio Quintino Sella, poi l’ascesa al Rosa, “Non è difficile, può farlo anche lei” mi dice rassicurante. Io, che l’estate scorsa mi sono inchiodata al rifugio accanto, sento i brividi (ma stavolta di ammirazione) aumentare e poco c’entrano con la temperatura che fuori sfiora i meno 15 e dentro forse arriva a 12 gradi. Ripenso al suo ingresso trionfale nel 2012 a Victoria Park, in occasione di uno dei tanti eventi organizzati per le Olimpiadi. Appeso alla teleferica che passa sopra il parco è rimasto a penzoloni per 5 minuti buoni per un blocco del meccanismo. Deve averci preso gusto. Ma è ora di mangiare e BoJo, come viene chiamato dagli intimi, mi allunga la manona e mi augura, in coro con la family “Happy New year”. Chissà che year sarà per l‘Inghilterra di cui è il Segretario di Stato per gli Affari Esteri e del Commonwealth. Un anno in cui saranno stabilite le basi del distacco o della deriva, che dir si vorrà, dell’isola. Di certo il “Cycling Boris”, nato a New York, figlio di un eurodeputato, origini francesi, tedesche, turche e russe non teme le posizioni vertiginose. Cheers mr Johnson e a presto tra questi monti. L’exit è dietro l’angolo, occhio a non inciampare. Happy New Brexit. Boris Johnson, British Foreign Minister, raised his glass of red wine and offered a toast with a benevolent smile, affectionately surrounded by his family. Note however, that the paladin of the “disunited kingdom” is not celebrating in London, and not even in the rolling hills of the Cotswolds. He is aiming higher, at the top. And that’s exactly where we caught up with him; between Mount Sarezza and the majestic gray top, Val d’Ayas, in Valle d’Aosta, Italy. But what does that have to do with Brexit? After all, vacations don’t have to be “staycations”. And after his extended wait for a rental car at the Caselle airport which was reported in the media, here he comes, not surprisingly, at the “Tana del lupo” near the chairlift that goes to the Gressoney Valley. His entrance in the slope-side restaurant certainly doesn’t go unnoticed. Gigantic, shockingly blonde and surrounded by his offspring and minute brunette wife, he chooses a table near the stove. “I always come here”, he tells me when I approach him to ask him if, after all, good old Europe can still have an appeal. With an open menu in one hand and freshly poured wine in the other, he tells me about his passion for these mountains, while the young giggle and his wife Marina looks at me from the head of the table. “Are you good at skiing”? “Not at all”, he states with conviction. Somewhat chilled by the prospect, I resolve to keep a safe distance after lunch on the slopes, whilst he tells me about his climbing adventures during the summer. First the night at the Quintino Sella refuge, then the climbing to the Rosa. “It’s not difficult”. “You can do it too” he says reassuringly. The chills increase for me, this time with admiration, as this past summer I didn’t manage to go any further than the next refuge, and that has little to do with the temperature which is close to minus 15 degrees outside and maybe 12 degrees inside. I think back to his triumphal entry at Victoria Park on a death-slide during the 2012 Olympics, where, because of a technical hitch Boris had dangled for a good 5 minutes. He must have enjoyed it, I think. But it’s time to eat and Bojo, as he is called by his close friends, gives me his big hand and together with the family wishes me “Happy New Year”. Who knows what this year will be like for the United Kingdom of which he is the Secretary of State for Foreign and Commonwealth Affairs? A year in which the country may feel the discomfort of a hard Brexit rather than the soft one it would like? We’ll see which. Born in New York. Son of a Euro MP, of French, German, Turkish and Russian extraction, “Cycling Boris” is clearly not afraid of heights and points to a new peak. Cheers Mr Johnson, see you again on these slopes. As you exit, mind the step.